Options: 20 lb. 40 lb. It is for use on all types of turf, including St. Augustine, Bermuda, and more. With the addition of our Aqua Turf™ Water Management Technology improving nutrient and water infiltration. 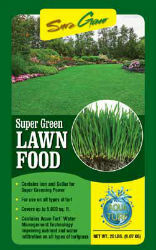 Contains Iron and Sulfur for super greening power.